Granted, there is nothing like eating fruits and vegetables from your own garden. Hard work, dirt-stained nails, and sweat on the brow eventually lead to being able to enjoy the succulent fruit of one’s labor. There is a sense of accomplishment and fulfillment in eating daily produce, and stocking rows of canned goods from one’s own patch. If, however, you don’t have the time or the space to have your own garden, you can provide yourself and your family with fresh homegrown vegetables almost every day. You can still enjoy a sense of accomplishment in knowing that you are providing healthy food choices at your table. 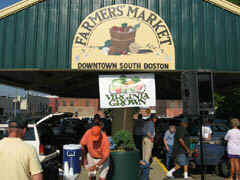 Visit the downtown Farmer’s Market Monday through Saturday during the months of April through December. There you will find tender peas, red beets, white or red potatoes, turnip greens, lettuce, tomatoes, spinach, turnips, and a host of other vegetables or fruits that are in season. 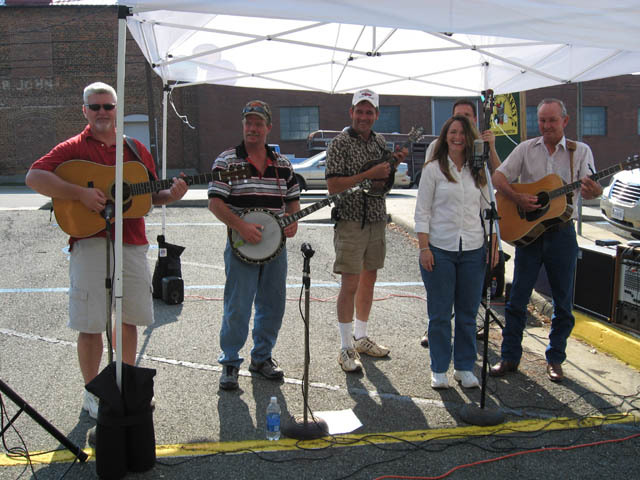 Pretend you’ve got your own spot in your backyard; visiting the Farmer’s Market on Broad Street is like walking out your back door and coming back inside with freshly picked produce. The only difference is that you will have missed the back-breaking bending, dirt under your nails, and sweat dripping from your brow that is a necessary part of the process for gardeners. 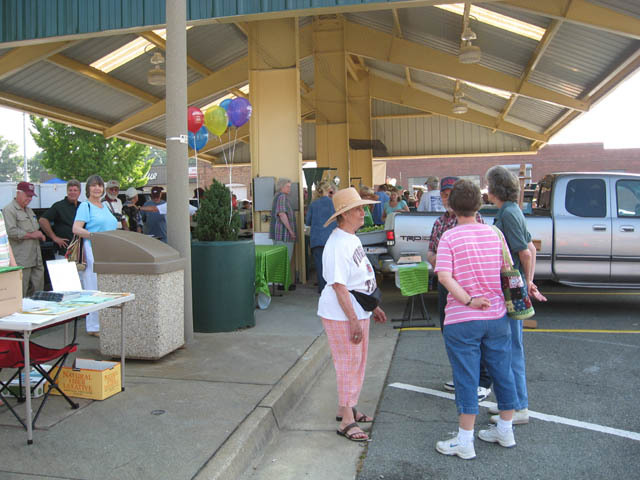 "We want people to come here to get their produce and not have to go to Wal-mart to buy something that came from another state," one vendor stated at Saturday’s grand opening of the Farmer’s Market. Granted, non-local produce is okay if there’s nothing better; but why settle for something that has been trucked across the country when you can buy produce from your own county and community? This year’s market got off to a good start a few weeks ago, and some of the same vendors are back this year. Others appeared on Saturday for their first day, not knowing quite what to expect. Lynn Spry of Virgilina Acres unloaded her homegrown vegetables and herbs from the back of her pick-up truck. "I go organic all the way; I use no pesticides," she informed me. Her wares this year include spinach and lettuce; she also has cut flowers. "This is my first time, and I didn’t know what to expect, but I’ll be back," she beams. Mary S. Medley has been selling baked goods for over fourteen years. She says she had to do something to fill her time after she became a widow. Her treats include fried sweet potato pies, pound cake slices, and lemon tarts. 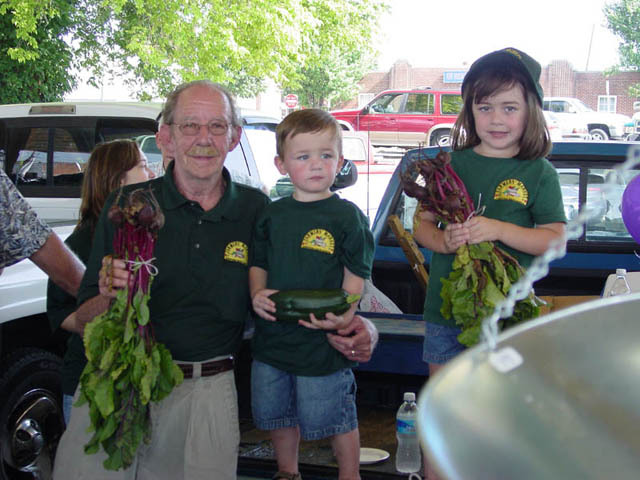 A contractor for thirty seven years, Dave Meadows has enjoyed growing his own vegetables and sharing them with his neighbors and friends over the years. "But it got to where people wanted me to deliver them to their door," he shares, "so I started coming to the market." He’s been coming for four years on Wednesday and Saturday. "I figured if I was doing all the work, people could start paying me," he smiles. 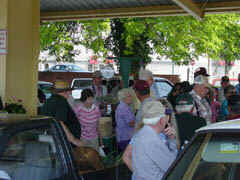 Moving up and down the aisles, one can hear farmers swapping stories and experiences. It is obvious that they know each other and have developed camaraderie over the years. Meredith Bowman stops at Ray Satterfield’s table. "If I put these [green] tomatoes in a bag, will they ripen in a few days?" she asks. "Yep. I tell folks that all the time, but they don’t believe me," is his response. I’m next in line at Ray’s stand. When I ask for 2 pounds of new red potatoes, Ray tells me, "Pick your own; then you’ll know what you get." I choose the smallest potatoes and can hardly wait to serve them with the tender peas I purchased from another vender. Charles Stallard of Alton is selling plants. I purchase a Liriope, and by evening it is planted in my flower bed, hopefully to bloom and spread every year. This is Stallard’s first time, but he’ll be back. In addition to plants, he is selling cabbages. "I’ve got a big crop of tomatoes, but they’re not ready yet," he informs me. Nature’s Intent owner Chelsea Webber is purposeful in her planting and harvesting. "I use only organic methods," she shares. She has fresh dill and vegetables and will be bringing tomatoes in a few weeks. Steve is from Baskerville, close to Boydton. He is selling plants and hanging baskets. This is his second year, and you’ll find him there only on Saturdays. While most vendors are selling vegetables or plants, Crooked Creek Bison is selling Bison in steaks, burgers, roast, liver, and stir fry, just to name a few. "Rip" Ripplinger says sales are slow. "We’ll see how it goes today, and then I’ll decide if I’m coming back," he comments. Master Gardeners are also on hand, with brochures and willing answers to questions. The Farmer’s Market began under the direction of Phil Ramsey, former extension agent and now free-lance artist. "I happened to run into Ray Maneri at the YMCA and found out he was town manager. I told him that I’d like to get a market started to help the farmers in the area. He was very helpful in helping us get it started. 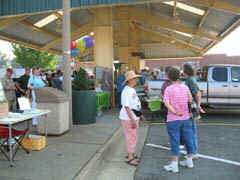 A few years later, we were able to have a pavilion put there to help provide shade and protection from weather." Does the man who was the brain behind the market still purchase items there, almost twenty years later? Phil replies, "We do stop there occasionally; unfortunately, they sell out so fast and we don’t always get there first thing. But the produce is always fresh, and it beats buying from the supermarket. Plus," he adds, "with the price of gas, produce brought from a distance is going to cost us more than ever in the stores." The Farmer’s Market is open from April through December, Monday through Saturday. Saturday’s hours begin at 7:30 AM; all other days begin at 10 AM. 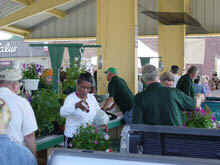 Vendors stay, Ray Satterfield says, until they are sold out or else it gets too hot. 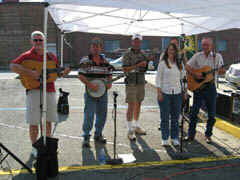 This year’s grand opening included music by Lawson Creek Grass Band, door prizes, free beverages and pastries. So if you’re longing to cook up a mess of greens or want succulent cantaloupe picked fresh from the patch, come to the Farmer’s Market. You’ll be glad you came!